It was early 2011 when Independence Park resident Amanda Dodge began to feel truly helpless. Her younger brother Kevin Dodge was suffering from IgA nephropathy, an aggressive kidney disease, and after months of exhaustive tests, Ms. Dodge, 32, was deemed an incompatible kidney donor. Coming home from the hospital, she'd never felt so low. After a few calls to the site's founders, Ms. Dodge created an online profile for her brother and started asking for donations. By this time, he had found a kidney donor in a friend of his, so Ms. Dodge focused her efforts on raising the funds to help both with post-operative appointments and travel costs. She posted a target of $5,000, spread the word through social media, surpassed her goal in just four days and kept going. “I ended up raising $9,164. Now I pay bills for both of them whenever they need it,” she says. Mr. Dodge, 28, is now healthy and gets choked up when talking about how GiveForward donations have affected his life. “I can't put into words how thankful I am that so many people helped out. It hit me hard,” he says. These are the types of stories that GiveForward co-founders Desiree Vargas Wrigley, 30, and Ethan Austin hear every day. The pair founded the site in 2008 after researching what types of donations have the biggest impact. “We realized that more than half of Americans can't come up with $2,000 for medical emergencies and 50 percent of bankruptcies are a product of medical debt,” says Mr. Austin, 30. 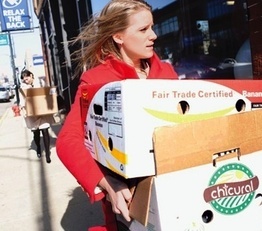 GiveForward is one of a handful of online philanthropic platforms sprouting up around Chicago. They're part of a broader crowdfunding wave that's changing the shape of philanthropy—putting the power of setting charitable priorities and targeted giving into the hands of individuals instead of large institutions. The fundraising goals that participants set tend to be relatively small and tightly focused—a few hundred dollars to finance a job search here, a few thousand to start a neighborhood garden there—but technology is expanding the reach of both donors and recipients, and trend-watchers believe charitable crowdfunding is here to stay. Internet-based giving has been around for more than a decade. Donors Choose, for instance, was founded in 2000 by a Bronx-based teacher eager to finance school supplies for needy students, and the organization says it has raised more than $110 million since then. Kickstarter, perhaps the best-known player in this category, made a stir in February when a co-founder noted that the New York-based arts microfunding site was on track to distribute more than $150 million this year—more than the National Endowmen for the Arts' fiscal year 2012 budget. The proliferation of crowdfunding sites is tough to pin down, but there's little doubt there's been an explosion. Just a few years ago, only a handful of sites were in operation. Today, there are 138 in the United States alone, according to Crowdsourcing.org, a Los Angeles-based website that tracks the sector. A local entrant in the field is Evanston's Benevolent.net, run by Megan Kashner, 42, a former staffer at the Taproot Foundation, a San Francisco-based nonprofit that connects nonprofit clients with business talent. Ms. Kashner says she woke up one morning in February 2011 with an idea on how to help impoverished people with one-time needs. “I thought I'd create a site for persons who needed funds for things like bus passes to get to work and car repairs for jobs,” she says. Ms. Kashner founded the site in August and left Taproot in December to focus full time on the project. Today, she says the site is growing and attributes that to the use of videos of potential recipients, which help donors feel more connected to causes. “We also have a validation model where we will only work with people associated with nonprofits,” she adds. In Humboldt Park, Dawn Hancock was an early crowdfunding adopter when she launched ReasontoGive.com in 2007. The site is an offshoot of the Chicago-based Firebelly Foundation, an organization that includes a for-profit design studio and a design incubator for entrepreneurs. Its primary purpose is to raise money for residents of Ms. Hancock's neighborhood. Like Benevolent, Reason to Give includes videos of people seeking donations. “I formed Reason to Give after being inspired by ‘Extreme Makeover' (the ABC show that gives a hand to people in need) and wanted to help people right in my community,” she says. Reason to Give donations go directly to recipients and to services such as workshops on computer training and healthy eating on a budget, says Ms. Hancock, 38. Her design studio covers overhead costs. ZealousGood.com is a Chicago-based crowdfunding site hitting a different market: nonprofit agencies in need of hard goods. Brittany Martin Graunke heads up the operation with a small team of volunteers. She started the site in March 2011 with the mission of matching nonprofits with individuals or businesses in possession of supplies, such as office furniture and computers. Ms. Graunke is convinced the model works for one reason: transparency. “Crowdfunding is working because it means so much more when you can donate something and know where it is going,” she says. Zealous Good's Brittany Martin Graunke dropping off supplies to a Chicago non-profit.